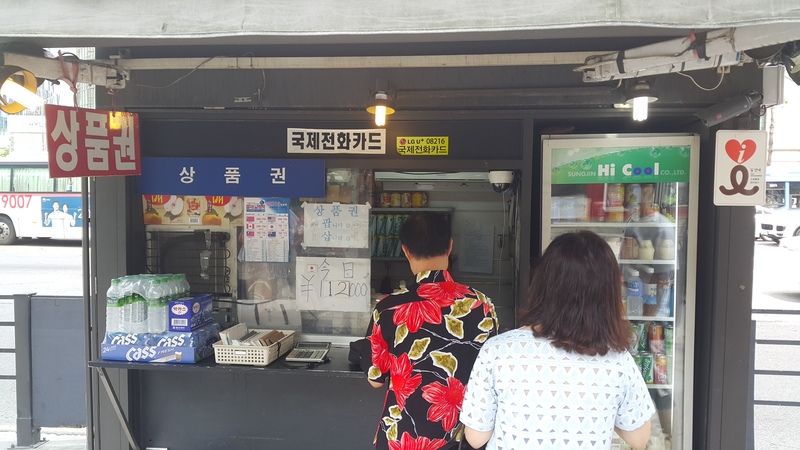 So hopefully on your tour of Korea, you come here eating the best Korean food for your breakfast, lunch and dinner. But then there’s late at night when you are sitting in your hotel and wanting something quick to take back to your suite. 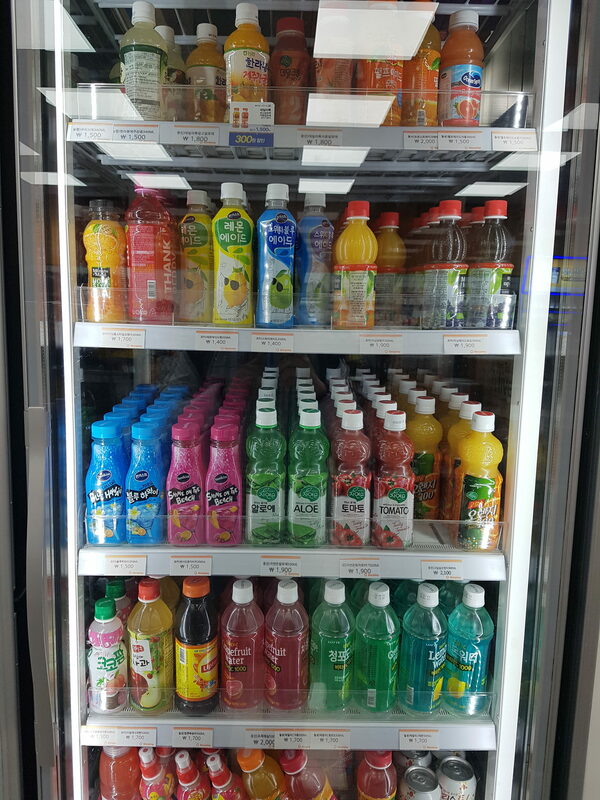 There are convenient stores all over Korea. Pretty much on every major street corner you will find one, from the global chains to the local ones. A lot of you will find your basic staples like Coca-cola, Minute Maid Orange Juice and Lays Potato Chips. But there’s a whole world of good eats sitting on the shelves that you probably would never even think of. Simply because you can’t read the labels or they look just so weird! No worries, we are here to help. I will walk us through a convenient store in Korea to talk about the things you shouldn’t miss out on. Or more importantly, what you should avoid! 1. 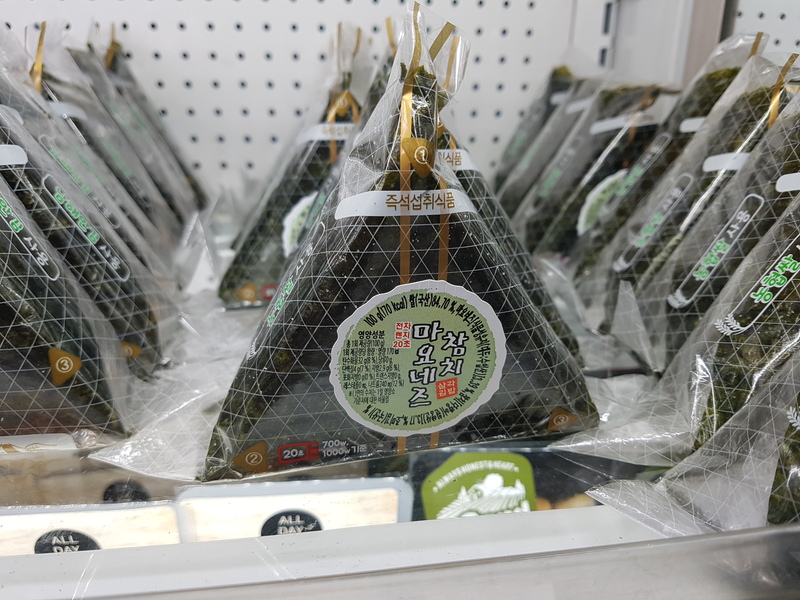 Sahm-gak (Triangle) Kimbap: Traditional kimbap comes in rolls like something you might see in sushi. These are made in the triangle form, or sam-gak. They are basically sticky rice stuffed with different kinds of goodness, like beef, chicken, pork and other great things. There are the spicy and non-spicy. Veggie, tuna etc. And they are all wrapped in seaweed lavers to keep them nice and compact. Nice and cheap and great for on-the-go meals or simply a late night snack. Pay attention to the instructions and illustrations on the back on how to open the packaging up. Otherwise you’ll end up unravelling the whole kimbap on yourself defeating the very purpose of its convenience! Try the Mayo Tuna featured on this pic. My favorite. 2. Doh-she-rahk: Or lunch boxes..but you can have them any time of the day. These are a meal in itself. Comes with rice, meat of choice and a set of side dishes (banchan) and are even more cheaper than going to a restaurant and getting the same thing. The quality of these things have gotten so much better and are the fastest growing items in convenience stores. Demand for cheaper quick meals and the rise of solo eaters have made a market for these. Also celebrity chefs have come up with their own recipes to help boost the appeal of these. Go before lunch and you will see these things piled up in the refrigerated section. 3. Drinks: What you probably won’t figure out is the tea section. There are all sorts of teas that are extracts from Korean raisins to whiskers of corn husks. All of them are good for you and you can drink them as if they were just non-caloric flavored water. There are also the ones that are made for men, but quite frankly anyone can drink them. You won’t be disappointed with any one of the. As for my favourite drink, it’s a soft-drinks called Milkis. It’s basically like an A&W Cream Soda except its more milkier as the name might suggest. Definitely a lot of stuff you won’t find back home but that’s what you are out here for, right? To try something new! Women: Avoid this one at all costs! The character says man. This will grow you balls and chest hair. Just kidding! But yes, marketed to men. 4. 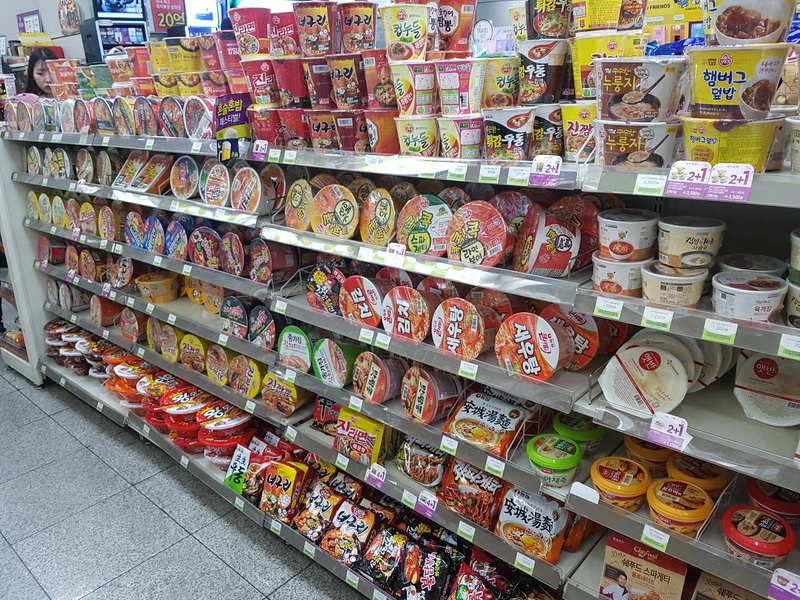 Ramyeon: You will find that there is one whole section dedicated simply to ramyeon. Take your pick. I personally like the spicy ones but there are a lot of other good ones without all that kick. Then there are the soupy ramyeons and then the dry ones where you are supposed to drain the water out like the Kok-kok-kok series from the Oddugi brand. You fill them up with hot water just like any other instant noodles. But before you mix in the sauce, make sure to drain the water by lifting up the tag on the cover. Also there are special sections inside the convenient store where you can get hot water as well as dump out the broth in a garbage can. 5. 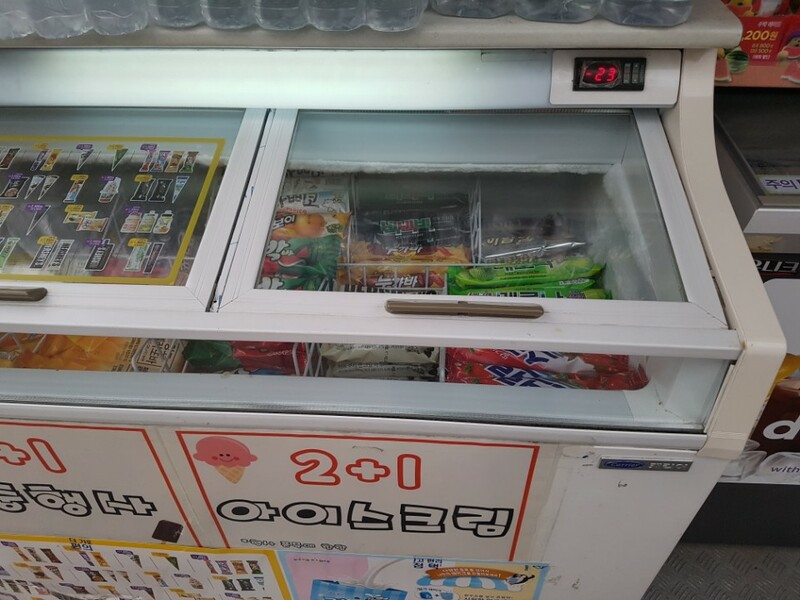 Single-pack Ice cream: You can usually find these in refrigerators just outside the doors of the convenient store. There’s tons to pick from and you probably can’t go wrong with any of them unless you think that uhm, red beans shouldn’t be…sweet. 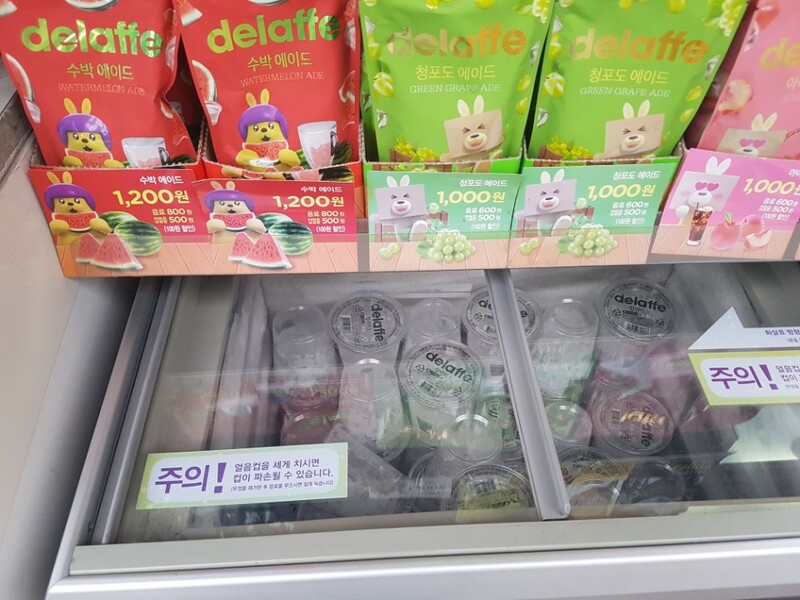 (just want to remind one another of 3 words: Boston baked beans) Anyway, ice cream in Korea is served year round, yes and including winter. And, yes it gets extremely cold here. Remember, we are hosting the Pyeongchang Winter Olympics in 2018, so it has to. And have you ever tried eating ice cream in the middle of winter? It’s not so bad and can be euphoric! Just imagine: You are walking outside and it feels cold on the outside of your body. The inside of your body is warm. But then you eat ice cream. Your body on the inside is getting colder. Now since the outside of your body is cold and the inside of your body is cold, what happens next? Magic. You don’t actually feel cold anymore because the relative feeling of cold is less extreme. Got it? Now try it! 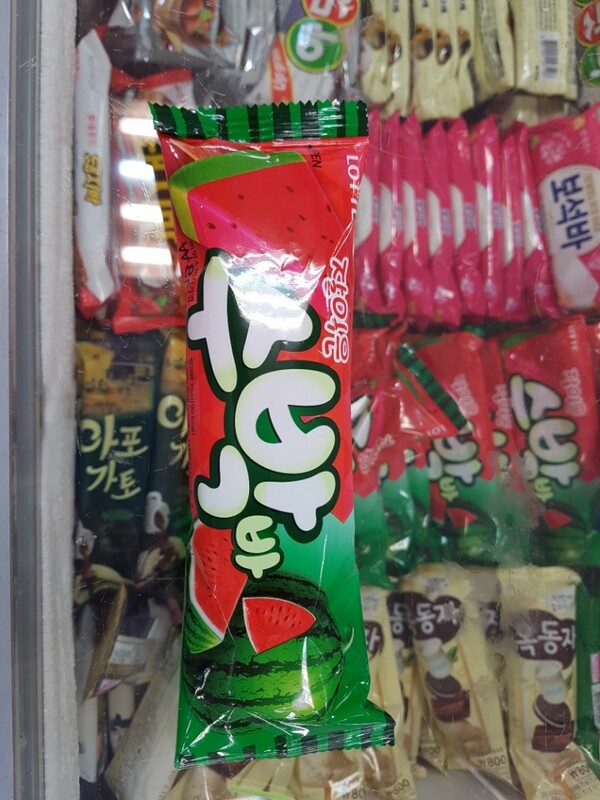 Oh yeah and talking about which ice cream to get…I personally love the watermelon ice cream. It’s got 3 different flavors all into one ice cream bar. 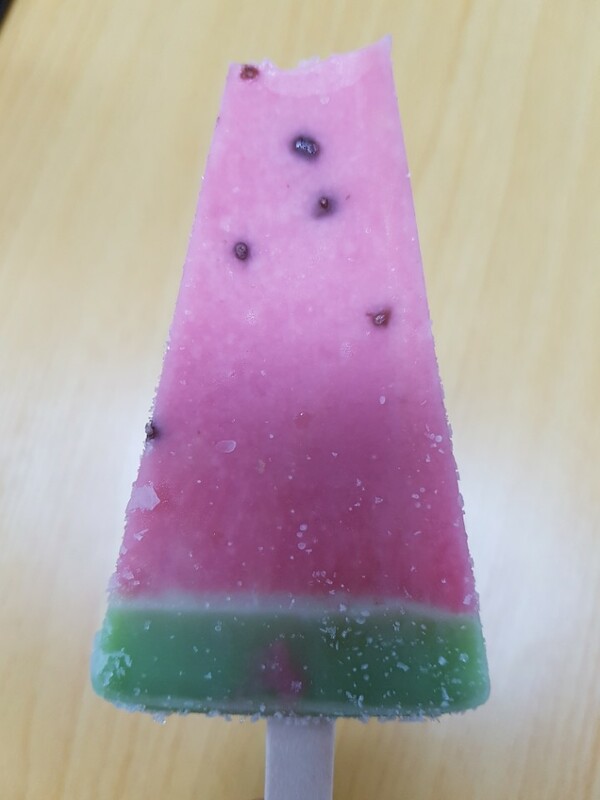 It’s cut into a watermelon triangle and starts out by biting into the red watermelon flavored part of the ice cream – Awesome! The next thing you will notice is the seeds of the watermelon ice cream. They are made from chocolate covered nuts. And then lastly, is the watermelon rind which is a great finale to it because of its stark contrast in flavor against everything else – melon! Trust me, it all goes wonderfully together. Sorry, I couldn’t wait. Had to take a bite. Now we can get into the classic must haves too, like banana flavored milk or honey butter chips, but I think there’s already been a ton written about those. You can also get a hot cup of brewed coffee for less than a buck from a machine. You can also get them iced by pouring pouch coffee into a cup of ice the convenient store gives you in the freezer section. 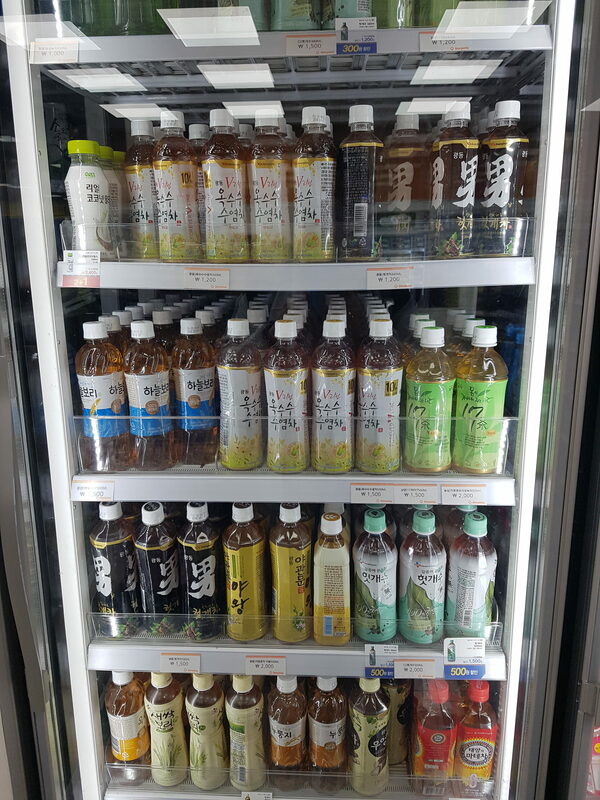 But if you say you’ve got a handle on Korean snacks in convenient stores and are ready for some expert level stuff, try concocting the Mark Special. If you need help translating or want to discover other great recipes, contacting one of our tour guides here. They just sellin’ cups of ice?? 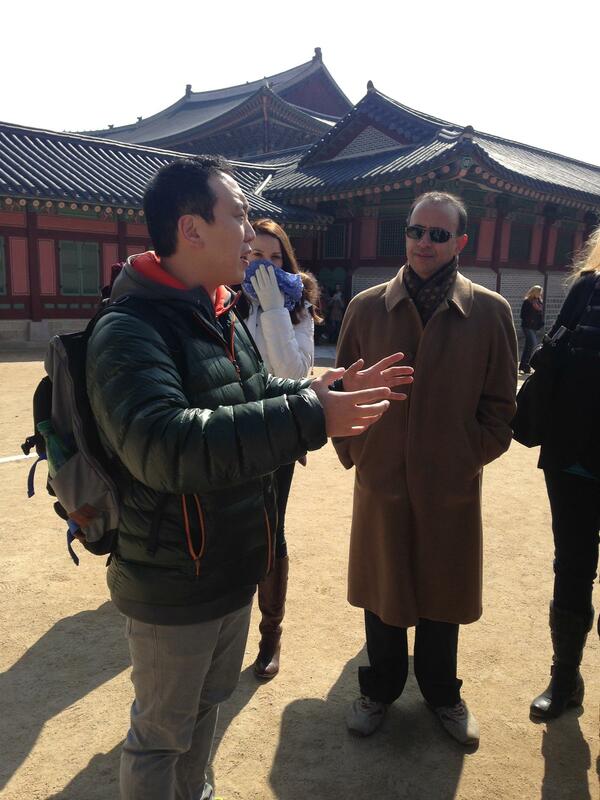 So I am in Myeongdong at least once a week doing a Seoul city tour. While I’m there I am always checking out the great street food, the rates on the US dollar as well as the prices of sangpumgwon (상품권). That’s pronounced Sahng-Poom-Guwon. Memorize that word because it will give you an automatic discount when buying stuff in Myeongdong. You don’t need to register for anything and it’s completely legal. It’s one of the great secrets of Myeongdong that really doesn’t need to be one anymore. 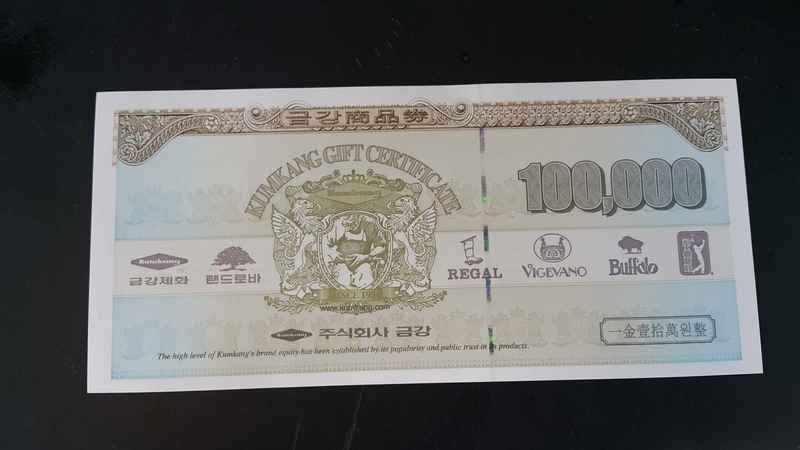 So the sangpumgwon are these gift certificates that you can actually buy and sell from kiosks in Myeongdong like this one. Look for the Korean writing 상품권. 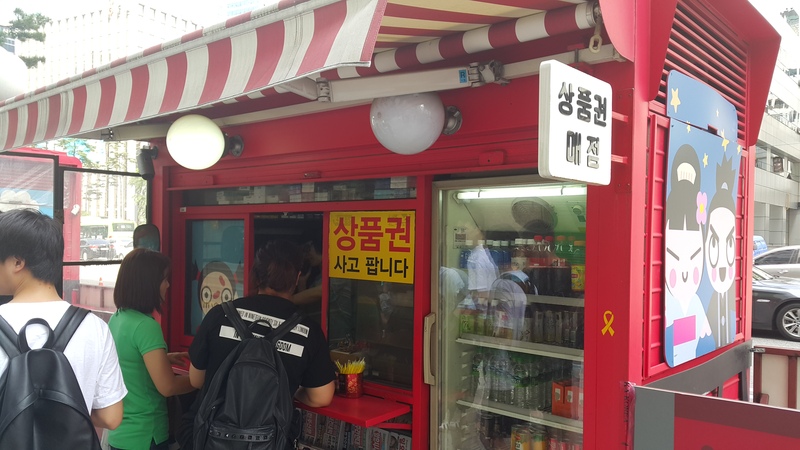 This particular kiosk is located right out of Euljiro 1-ga Station (Line 2) exit 7, but you can find others inside Myeongdong. These are real gift certificates issued by the respective company sold at a discount. People pass them up these kiosks without ever knowing they are being sold there because none of them bother to write it in English (nor in Chinese for that matter). But all you have to do is go to one and say that magic word. They will then present you with these gift certificates and you just tell them what kind you want. There are 2 kinds: One for Lotte and the other for Kumkang Shoes. 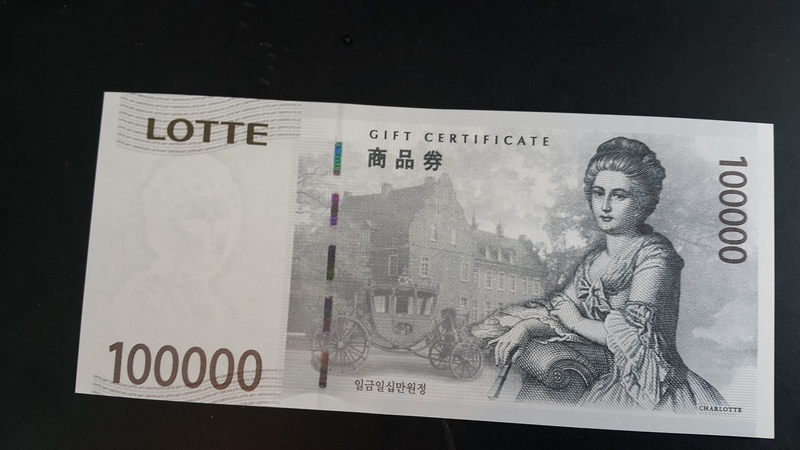 Lotte Gift Certificate can be used at any Lotte brand store. Kumkang Gift Certificates. Big store with a wide selection of shoes in Myeongdong. Love Land Rovers. So last week I wrote up a post about the top common mistakes tourists make when they come to Korea. It was getting to be long so I broke it up into two parts. That was 1 through 5 and now I’m presenting the last 5 this week. They come in no particular order. Again, nobody is going to put you down for committing any of these, but it’s just good to know before coming here. 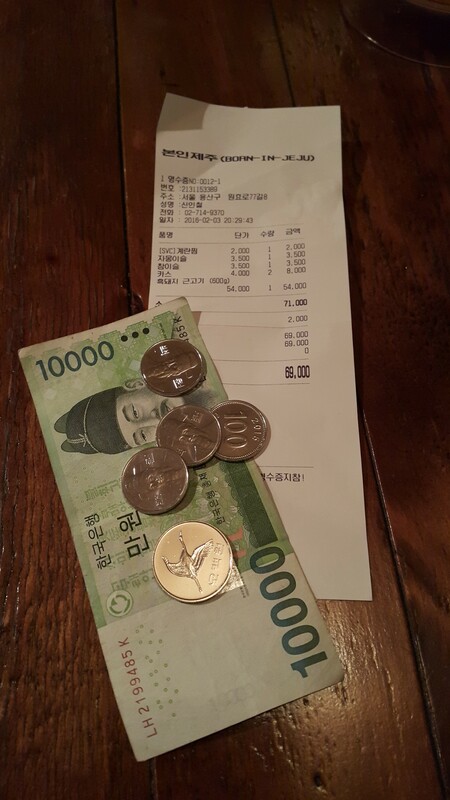 They try to give tips – There’s no tipping culture in Korea. Do not tip your taxi drivers nor your waitresses. With customer service in Korea, you get 5 star service regardless of a tip or not because it’s already embedded in the price. It’s part of the reasons why a Samsung phone costs more in Korea than anywhere else in the world. No need to tip. The last thing we need in our economy is more inflation or worse…people expecting or demanding tips. If you really want to do something for us, a gift from where you are from is always a nice gesture. 15%, 25%? Pre-tax? Post-tax? No need to stress about that stuff here in Korea! 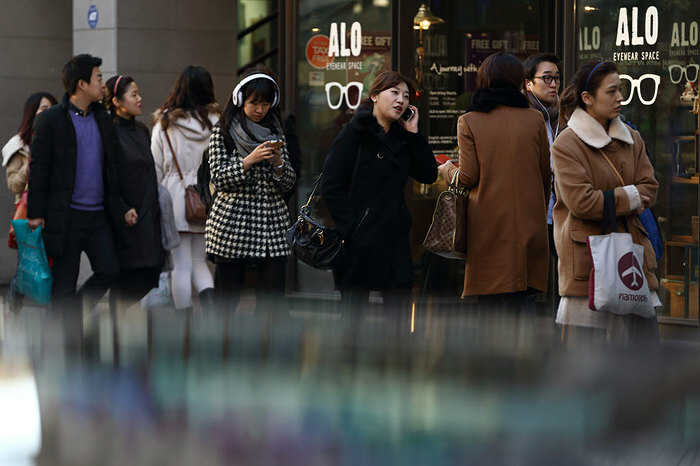 Being afraid to ask for directions – When you first walk down the streets of Seoul, you may notice that people don’t really have expressions on their faces. They may seem cold or look unapproachable. But deep down inside what you will find is that the Korean people are extremely friendly. We are a society that is based on Confucian principles. One of those values is that it is considered rude to show in public, emotions that you are overly happy or even sad. People tend to mask this by maintaining the neutral face that you see. With that said, I wouldn’t just jump in front of people and ask for directions. They will run away. I suggest the slow, i-look-kind-of-lost-type-of-face approach while clenching onto a map. And don’t be afraid if you think that they might not speak English. The younger generation can speak enough to at least point you in the right direction. Don’t expect a full blown conversation, but they would be happy to help out and practice their English on you. 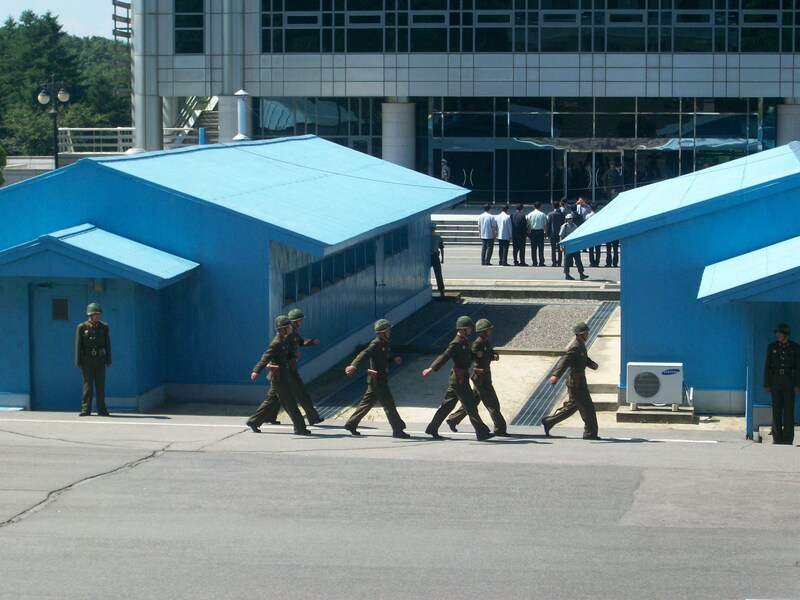 They don’t visit the DMZ because they are afraid of North Korea – I get a lot of customers who tell me they don’t want to visit the DMZ because they are afraid of North Korea. And then I look at them strangely, “Yet, you came to Seoul which is only 40KM away is perfectly fine?! ?” So I’ll put it to you like this: If North Korea ever attacked South Korea, the DMZ is the last place they would start (JSA – The Joint Security Area for that matter). It is just as much a tourist spot for North Korea as it is for South Korea. If they were to attack, then they would probably start somewhere like the maritime borders like they did last time or just straight up bomb Seoul like they did at the start of the Korean War. Just go to the DMZ. The North Koreans putting on a show for us. Bravo. Well worth the price of the tour! It was better than Cats! They go with an travel agent that puts ginseng or raisin extract store on the itinerary – Or amethyst, seaweed or cosmetics store. Don’t get me wrong. 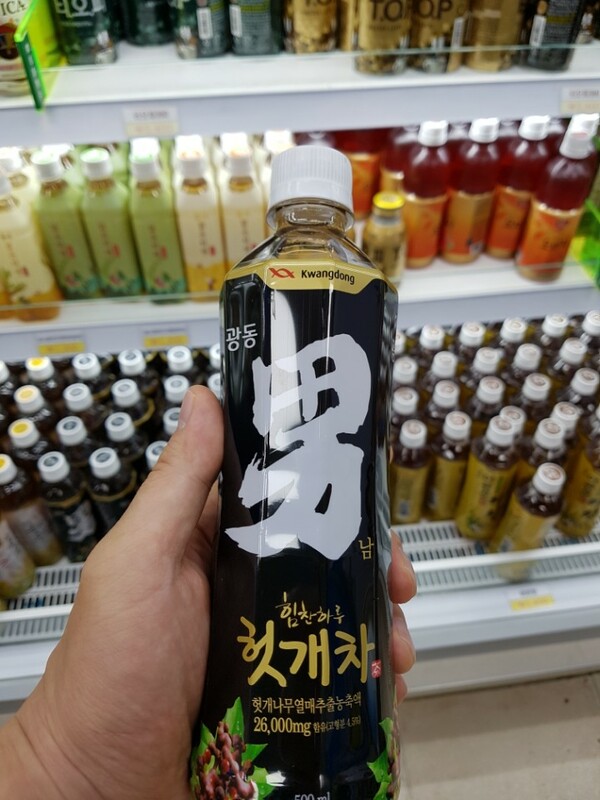 Ginseng and raisin extract are great products of Korea and you should buy them as souvenirs. In fact, I live by ginseng and eat it all the time. But when you see it on the itinerary from the tour companies, you should beware. This may be a tourist trap – literally. They trap tourists in a room where a someone tries to sell you this stuff. There are no prices listed anywhere so it’s easy for them to jack up the price and they close the entry door on you. A lady will then start explaining the health benefits to it and give you a demonstration on how to use the product. Sure, there’s value in that and there’s no pressure to buy plus it might even lower the price of your tour, but you waste a lot of your limited time in Korea there. Your vacation ain’t that long! 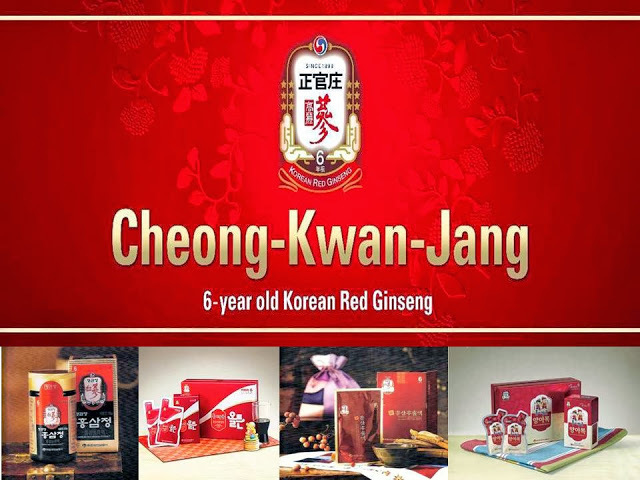 If you really want ginseng, I would feel much better taking you to a Cheong-Kwan-Jang which can be found on any street corner in Korea with reasonable prices. They did not get a tour guide – As much as it seems like a plot to plug our services, it’s true. Even though Korean is a developed nation, it’s still very raw. We don’t have the tourism infrastructure that other countries have so it’s tough to go at it alone. Especially when you are trying to get outside of Seoul, you waste a lot of time with the language barrier and unfamiliar systems. A good Korean tour guide will tidy all that up for you. Sure you can read up on travel guides and blogs on how to get around, but the reality is that it’s pretty tough once you are here. And if you try to go about the palaces alone, they just become empty buildings with no character. You need a great guide to bring that all to life for you and tell you the stories that really makes these places so amazing. I say this because the last thing I want you to do is leave here with a bad experience or worse yet, leave here more confused than you did before coming here. You are going to leave here so educated on Korea. You all are Korea experts now! I get a lot of tourists saying to me, “Rob, I’m a foodie! Take me some place good to eat where all the Koreans go!” Or, “Rob, I’m an adventurous eater! I want to try new things!”. And then my mouth just drops. Whaaaaaa?? How can you tell me you are any sort of self-respecting adventurous eater of foodie, if you can’t indulge in anything spicy? It is the crux of Korean cuisine and the centerpiece of every dining table here. Look, I get it. You were hurt once. Stung…and you don’t want to feel the pain of it again. But that was years ago…it’s time to move on! The Korean spice is a very different kind of spice. Other spices will give a sharp sting on contact and leaving a lingering singe in your mouth. Others you’ll feel it after you ingest it as it makes its way through your stomach and eventually scorches the other end of your gastro-extremities. The basic Korean spice is a bit of a warming spice. You won’t feel it right away, but as you fill your stomach with beef, rice and kimchi. And more beef, more rice and more kimchi…you’ll start to notice some tingling sensation in your taste buds. Things are starting to get warmer but you can consume it at a pace where you don’t overwhelm your mouth with any singular flavor.